This month’s “C” word is COMPETITOR. In the CYITML definition, COMPETITOR is someone with a desire and ability to compete; high expectations; tough-minded, or an ability to overcome; and brings the best out of teammates. This week, though, we’re leaving team sports to focus on an individual who has embodied COMPETITOR throughout his career: Tom Watson, who led last weekend’s Senior British Open on Saturday. The following is an article that was previously written for Metro Sports – edited for timeliness. 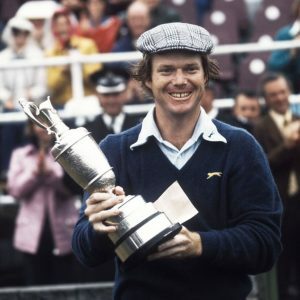 Watson with the Claret Jug after winning the Open Championship in 1975. The greats seem to do this late in their careers — leave us with at least one lasting image or teaching moment that we want to pass along to our kids. Watson’s play at the Old Course in 2010, as well as his remarkable weekend a year earlier at Turnberry, when he came within inches of winning the Open Championship, gave us a chance to relive his career with our kids. It was a chance to tell them about appreciation and admiration and heart and desire to be the best. And, of course, competitiveness. Watson showed us each of those traits in that brief moment on the Swilcan Bridge. It was the second time in as many months that Watson showed all of that, complete with an unforgettable image. Not many will forget Watson strolling down No. 18 at the U.S. Open on Father’s Day in 2010 with his son, Michael, walking alongside as his caddy. As a competitor, Tom Watson approaches every event with the same bravado and gusto that he showed early on the Tour after coming out of Stanford more than 45 years ago. “Well, my mindset is that I hope to be playing as well as I was going into last year’s Open, when I really felt I had a chance to win,” he said matter of factly. See, as he took us on an incredible — yet unexpected to most of us — ride at the 2009 Open at the age of 59, Watson felt he had a chance to win. Going into that tournament, he believed that. To many, it seemed like a fluke that Watson, in spite of being one of the game’s best-ever link players, could come within one stroke of winning his sixth Claret Jug. Heart. Desire to be the best. Competitiveness. Those three traits, plus appreciation and admiration, have guided Watson throughout his career. “How long can I stay competitive? How long is my body going to hold up? That’s it,” he said. “I’m just a golfer. I love the game. I have a passion for it.